“I was told that Captain Smith or one of the officers shot himself on the bridge just before the Titanic went under. I heard also that several men had been killed as they made a final rush for the boats, trying to cut off the women and children…." Triumph and Tragedy lists this man as “McGough, Mr. James R” (p.344 (7.)) This source also states that he his residence was Philadelphia, PA, having embarked upon Titanic at Southampton, traveling in First Class. His age was 36. 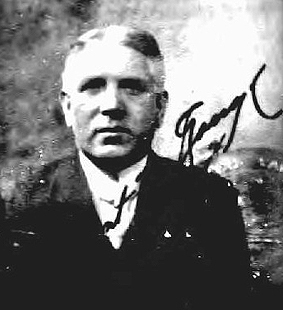 Sinking of Titanic, Eyewitness Accounts gives his full address at the time as “708 West York street, Philadelphia” and his line of work as “a buyer for the Gimbel store”. (p.123 (33.)) Another sources lists him as “a buyer with the firm of Strawbridge & Clothier” (Philip Hind, Encyclopedia Titanica (8.)). His lifeboat was No. 7, the very first boat to leave (reportedly an officer with “powerful hands” gave McGough a push into No.7, saying, “You are a big fellow; get into the boat.” –The Titanic, Wade, p.184 (18.)) and it is for this reason that his testimony is in the form of repeating what he had heard, since it is highly unlikely he would have seen anything from the distance that lifeboat No.7 would have been at the time of the alleged suicide. On day 18 of United States Inquiry Mr. McGough submitted an affidavit that confirms that his observations were based on rumour. On being asked “Did you see any neglect of duty by the crew?” he replied “No; they were all calm and apparently well disciplined; there was no panic at all.” Since No.7 was the first lifeboat to be launched it is logical he would not have observed any panic or any problems with the crew, since very few understood Titanic’s true condition at this point. Nonetheless, he did hear several shots on the bridge just before the Titanic went under, later told that the Captain or an officer had committed suicide. As a First Class passenger and respected businessmen, the question begs: would he repeat mere speculation or rumour and risk damaging his reputation? From what sources did he gain such information? Nevertheless there is no reason to doubt his account.